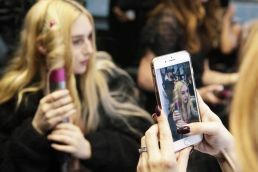 Following on from the runaway success of the Dyson Supersonic™ hair dryer, Dyson has unveiled its second piece of beauty technology: the Dyson AirWrap™ styler. The Dyson AirWrap™ styler uses jets of air to allow you to achieve voluminous curls, natural waves and smooth blow-dry finishes – at home. Dyson engineers always start with the problem. The teams researched current styling technologies and identified what they feel to be areas for improvement. Tangled hair. Temperature damage. Weak and unruly airflow. At the heart of this story comes a radical idea: harness Dyson’s digital motor to create a phenomenon known as the Coanda effect. The Coanda effect occurs when a high-speed jet of air flows across a surface and, due to differences in pressure, the air flow attaches itself to the surface. Taking advantage of this principle Dyson’s team of aerodynamicists created a way to style hair using only air combined with heat. The result, whether you choose to curl, wave, smooth or rough dry your hair, creates a natural look with a sleek finish, helping prevent extreme heat damage. “We have been obsessively manipulating airflow for more than 25 years. It is one of our core expertise. Harnessing the power of Dyson’s digital motor we have engineered a truly unique styling tool preventing extreme heat damage when styling. I’m immensely proud of what our engineers have achieved,” James Dyson, Founder & Inventor. People desire body, fullness and movement. They want to avoid limp hair with little body. Others desire smoothness without losing volume. They tend to suffer from frizz and too much body which makes styling difficult. “As stylists, we often see the damage that extreme heat can have on hair. Many women have had to compromise on the condition of their hair to create the styles they want. So it’s incredible that Dyson has engineered a tool that enables women to achieve so many different styles and have the best possible hair styling experience. 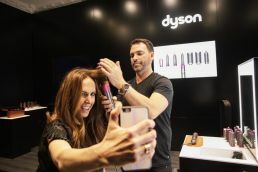 The Dyson AirWrap™ styler is a game changer, it’s what the styling industry has been waiting for,” Peter Thomsen, international celebrity hair stylist and styling ambassador for Dyson Australia.